KELOWNA, B.C. -- An aircraft carrying former Alberta premier Jim Prentice and three other people crashed into a heavily wooded area of southern British Columbia shortly after takeoff on Thursday night, killing everyone on board. Prentice's family confirmed that he was on board the small jet that was en route from Kelowna to the Springbank airport, outside Calgary, along with Ken Gellatly, the father-in-law of one of his daughters. "To lose two family members at once is unbelievably painful," the family said in a statement. 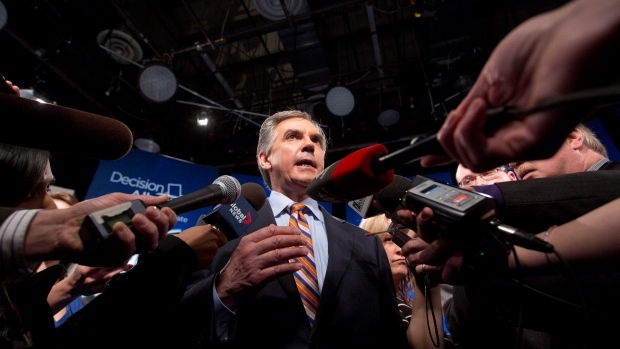 Prentice, 60, also a former federal cabinet minister, quit politics in May 2015 after the Alberta NDP swept the Progressive Conservatives from power. The family described Gellatly as "a very special man" and expressed the "heartbreak" caused by the news. "In the time Jim has been with us, he was a friend to many. Jim was a loving and compassionate man who dedicated his life to his family and public service. He will be so greatly missed." A respected figure, tributes to Prentice and his legacy focused on his ability to work on a variety of issues with people, regardless of their political alliances. Foreign Affairs Minister Stephane Dion, who like Prentice once held the federal environment portfolio, remembered his old political opponent as someone who listened. "We were not of the same political family but he was always open to dialogue. He shared the same concerns as me on the environment, although we had pretty different policies to propose, but he was always willing to work for his country as a parliamentarian, in the business world, for his province," he said. "It's a huge loss for Canada. A young man who had so much to offer to our country." Green Leader Elizabeth May said Prentice showed "genuine concern" in protecting the environment and took a "principled stance" in rejecting the Prosperity Mine near Fish Lake in B.C. in 2010. "It's a sad day for Canada and for all of us in public life. Jim will be missed." Former Alberta health minister Stephen Mandel said he was shocked to learn of the death of his friend and colleague in expressing his condolences to Prentice's wife Karen and their extended family. "Jim was an incredibly passionate, wonderful fine person. He felt deeply about people and whether there was opportunity for them." A team of investigators from the transportation safety board was at the scene of the crash Friday near the community of Winfield, about 18 kilometres north of Kelowna. Board spokesman Bill Yearwood said the Cessna Citation aircraft crashed about 10:30 p.m. Thursday, but he did not have any other information on what might have caused it to crash. RCMP Cpl. Dan Moskaluk said police were alerted when the business jet lost radar contact. He said its officers and a police dog reached the crash scene shortly after midnight. "There was catastrophic damage at the crash site," said Moskaluk. Sam Samaddar, director of the Kelowna International Airport, said the plane left at 9:32 p.m. and the airport was notified that radar contact with the plane was lost at about 10:15 p.m. The plane, which can carry up to eight passengers, crashed about 10 kilometres northeast of the airport, he said. Samaddar could not say who is registered as the plane's owner or whether it was rented. July 20, 1956: Born in South Porcupine, Ont. March 30, 2002: Steps aside as the federal Progressive Conservative candidate in Calgary Southwest so that then-Canadian Alliance leader Stephen Harper can run unopposed to represent the centre-right. May 31, 2003: Places fourth in bid to lead the federal Progressive Conservative party. June 28, 2004: Wins election in the federal riding of Calgary Centre-North for the newly merged Conservative Party. Nov. 4, 2010: Announces he is resigning as environment minister, effective immediately, and that he would be resigning as member of Parliament for Calgary Centre-North by the end of the year to take a job as vice-chairman of the Canadian Imperial Bank of Commerce. Prentice had also served as minister for Indian Affairs and Northern Development in the Conservative government. May 21, 2014: Officially launches his Alberta Progressive Conservative leadership bid. Sept. 6, 2014: Wins Alberta Progressive Conservative leadership. Sept. 15, 2014: Sworn in as Alberta premier. 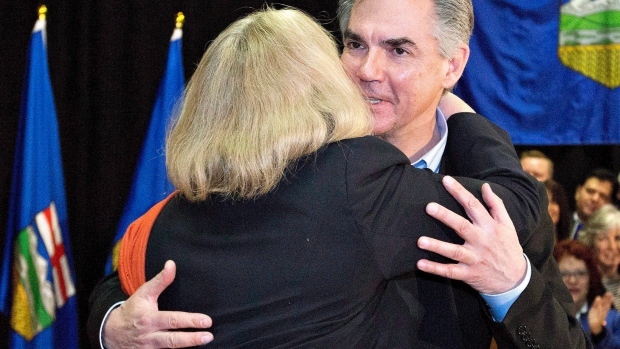 Oct. 27, 2014: Wins seat in the Alberta legislature in Calgary-Foothills. May 5, 2015: Resigns as leader of the Alberta Progressive Conservatives and gives up his seat in Calgary Foothills. Oct. 13, 2016: Killed in plane crash in Kelowna, B.C.